There are new, substantial limitations to the transfer of Post 9/11 GI Bill benefits effective on July 12, 2019, and the new policy applies to all the uniformed services including the United States Coast Guard, plus those commissioned in the U.S. Public Health Service and National Oceanic and Atmospheric Administration. Eligibility to transfer Post 9/11 GI Bill education benefits from a military member to their dependents will be restricted to those with less than 16 years of total service whether active duty or reserve. Prior to this announcement, service members could transfer the benefit at any time, provided they served a minimum of six years. The military member has completed a minimum of six years of service on the date the GI Bill transfer request is approved and there is a reenlistment agreement of four more years. The service member may, as an alternative, complete 10 years or more of uniformed service on the date the GI Bill benefits transfer request is approved. This applies to those who cannot add an additional reenlistment commitment of four years of service because of either a policy or statute, but agrees to serve for the maximum amount of time permitted by military regulations. In all cases, the dependent receiving the transferred Post 9/11 GI Bill benefits must be registered in the Defense Enrollment Eligibility Reporting System (DEERS) for the transfer to be approved. According to a Defense.Gov article, the 2019 GI Bill transfer policy change includes certain protections for service members who cannot meet an enlistment commitment or service obligation due to a “force shaping event” such as an officer being separated from military service due to being passed over two times for a promotion. This also applies to any enlisted member involuntarily separated for not meeting minimum retention requirements such as hitting the “high year of tenure” for the current rank. High year of tenure separations happen because enlisted members only have a certain number of years to be promoted to the next highest grade. Failure to be promoted within the established time frame results in an involuntary separation, but is not a punitive discharge such as a bad conduct discharge, etc. The 2019 rule changes will permit these service members (officer and enlisted) to keep their ability to transfer Post 9/11 GI Bill benefits even if they have not served the full commitment of their current enlistment at the time of separation. 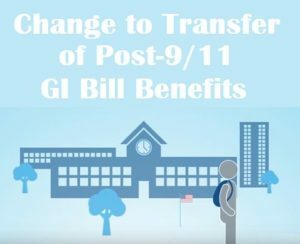 Those who are concerned that they won’t meet the 2019 criteria for transferring their Post 9/11 GI Bill benefits before the deadline should take steps to begin the transfer process as soon as they are eligible to do so under the current requirements. Those who cannot should apply right away should consider doing so as quickly as possible to avoid being caught in a rush of transfer requests the closer the July 12, 2019 deadline approaches. Since there is no guidance (at press time) as to how the Department of Defense and Department of Veterans Affairs will handle any such surge of applications, a proactive approach may be required to prevent delays or other problems. Defense Department officials are quoted on the policy change being motivated by retention-keeping service members in uniform for as long as possible before retiring or separating from the military. Retention is an important issue in the Armed Services; during the Iraq and Afghanistan campaigns the original policy that will end in 2019 was deemed an appropriate one based on the military’s enlistment numbers and other factors. In today’s current climate of increased growth of interest in military service, the Defense Department chose to re-configure the policy to better serve current retainability issues. The Director of Accessions Policy in the Office of the Secretary of Defense says, “This change continues to allow career service members that earned this benefit to share it with their family members while they continue to serve.” and is meant to keep the GI Bill transfer option as a distinct reenlistment incentive.